I love this time of year. We live in the countryside and the fields around us are filled with lambs just now. 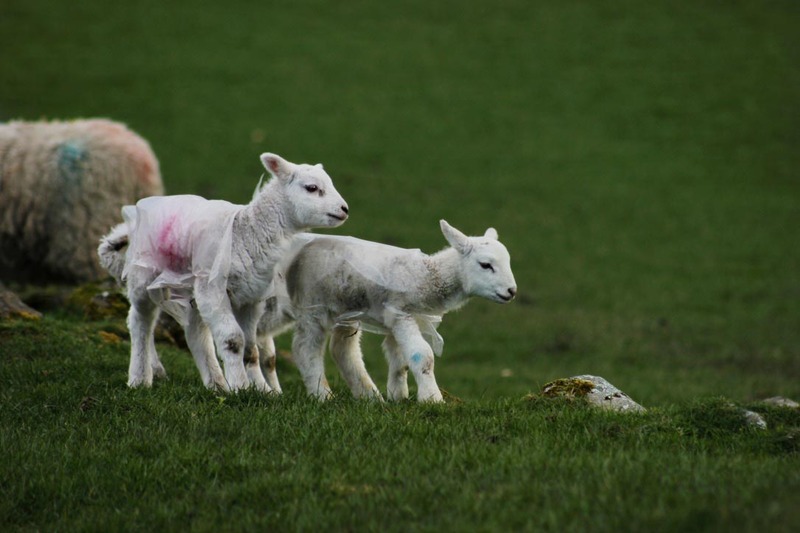 It always brings a smile to my face to see the wee lambs with their plastic coats the farmers put them in. As Spring can be quite a cold affair here in Scotland they need their coats trust me! 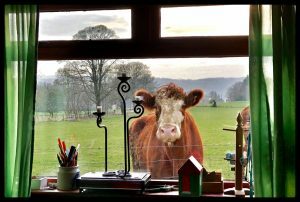 The field at the back of the house the other night had a few very curious cows in it too, which resulted in one in particular spending a good ten minutes checking us out. I’m sure she felt sorry for us being cooped up inside! 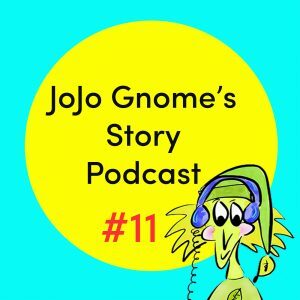 The story podcast (# 11) this month is all about Spring too. There’s the story of ‘Zack and the Beanstalk” complete with giant vegetable seeds. Also the story starter is all about magic seeds. Check out the wee film of Elmvale Primary 1’s drawings and suggestions for what they would grow with their magic seeds. My favourite suggestion was “a bush with statues of my friends on it” …I so want one of those in my garden. If you don’t want to plant seeds but fancy a bit colouring there are a couple of new pictures for you to print off and colour in. One’s an Easter egg picture and the other is spring flowers. If you enjoy the podcast please tell your friends with younger children about it. The podcast is free to download (no catches) from the website, iTunes and Spotify. I wanted to be able to give something back for all the help I’ve had and the joy I’ve had from stories over the years. 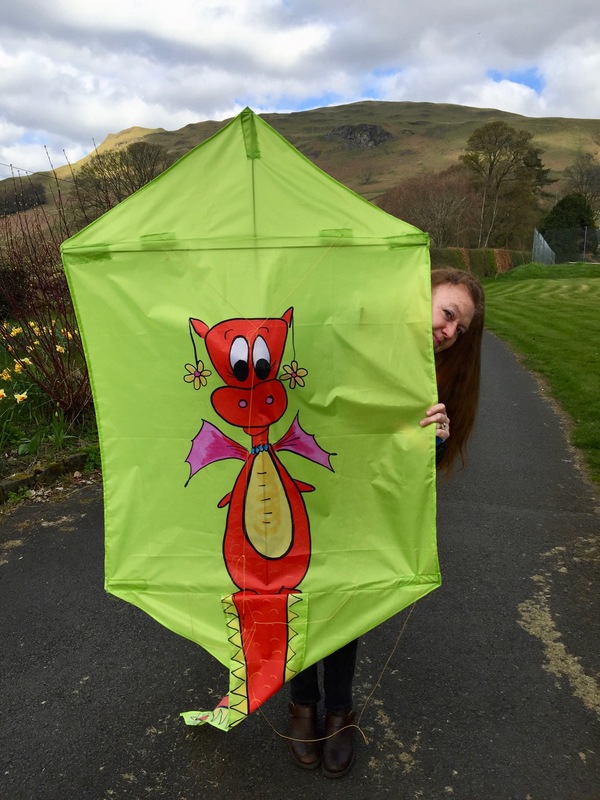 This weekend I’ve been indulging in one of my favourite pass times…flying and making kites. Well more making actually as I am planning a kite story soon and wanted to make a Mrs Dragon kite to go along with it. 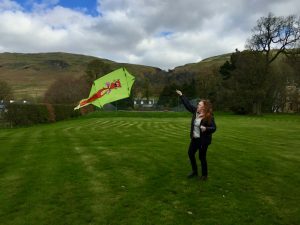 This time I tried a Rokkaku kite…. and yes it flies. I’ll do a kite post soon and let you see more of Mrs Dragon in the air!